Gracie, born circa 1956, comes from Utopia, her country is Alhalkere. She is the daughter of traditional artist Myrtle Petyarre. Utopia is a community approximately 230km northeast of Alice Springs, Northern Territory. 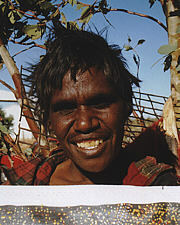 Gracie has always lived a traditional lifestyle, spending her early years collecting bush foods and living off the land. This was the way of life for central desert families throughout the generations. Her education involved living and surviving in a desert environment just as her mother had done and her mother’s mother before that. Gracie gained recognition as an artist working in the medium of batik, exhibiting her work with the Utopia owmen in Australia and overseas. Funded by the government arts programs and with the support of CAAMA 88, the Utopia women created a major work entitled "A picture story:. This was later aquired by the Holms a Court collection and later exhibited at Tandanya in Adelaide in 1989. In 1988 Gracie and the Utopia Artists started painting on canvas and using acrylic paints. She prefers the greater freedom and control through the medium of acrylic paints on canvas. Her earlier works are quite typical of "Utopia Art" Much line work depicting body-paint designs, and many tradition symbols are seen in her central desert dot paintings. Many of Gracie’s paintings reflect her Bush Plum Dreaming, sometimes her intricate and layered dot work detail the fruit which grows on low shrubs, the different colours of each piece indicates seasonal changes. Walking tracks, which meander through the bush that the women use to collect this favorite bush fruit are sometimes added. Collecting fruits a group activity and the older women use this time to teach the children about the land and their culture. Gracie also incorporates "Awelye" into her paintings. Awelye is the body paint designs significant to ceremonies and rituals that are the basis of her culture. Gracie currently resides on her traditional land at Mosqito Bore with her husband and two children. She has become a well respected artist within her Community who promotes her culture, country, seasons and ceremony through her paintings. Gracie’s paintings are sought after by collectors Worldwide. Selected Collections: Beher-Sammlung Privatsammlungen Reimers-Stiftung, Deidesheim; Robert Holmes à Court-Sammlung, Perth; Slaughter and May International Law, London.